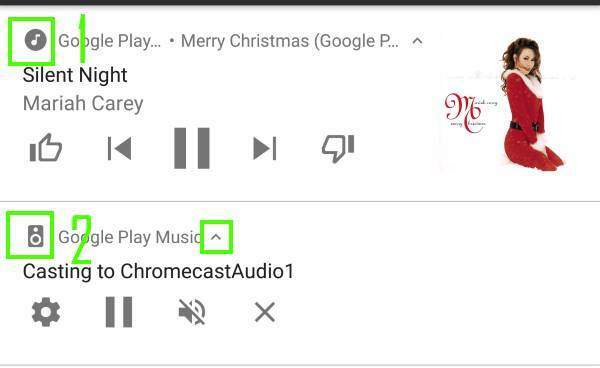 For example, when Google Play music is playing music to Chromecast Audio, you will see the notification in other Android phones as shown below. This notification appears not only on the device you initiated the casting, but also all other mobile devices in the same network, by default. So, any devices can control the playback remotely through the casting notification. You can simply pause it or mute the play. Of course, you can dismiss the notification by swiping it right or left, or tapping Clear all as shown below. But this will dismiss the casting notification for this casting only. When casting is initiated from any devices next time, you will get such a notification again. This is a nice new feature because you can easily control casting devices from any mobile devices in your home. It is not necessary to find the device imitating the casting. But for some owners, this can be annoying. They want to disable such notifications on some devices. This guide will show you how to disable Google Home and Chromecast casting notification on any devices. Please note you can turn off such notifications per mobile device, not per casting device. 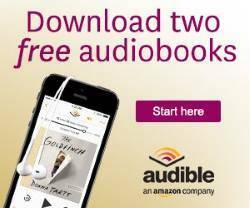 In other words, the setting is for each mobile phone or tablet, not for Chromecast, Chromecast Audio or Google Cast. What is the difference between casting notification and app notification? Although you can turn off network-wide Google Home and Chromecast casting notification, you cannot turn off the app notification in the mobile device from some apps. For example, if you cast Google Play music from your mobile phone to Chromecast Audio, you will always get notifications from Google Play music. The two notifications are different as shown below. In the screenshot below, icon 1 indicates this notification is from Play music. Actually, you should get this notification whenever you use the Play music app no matter you cast or not. Icon 2 indicates this is a casting notification (remote control notification). Some mobile devices (in this case, it is casting from this mobile device) is casting Play music to Chromecast Audio1. If you disable casting notification on this mobile device, you will only see Play music notification (the first one). Please note, in the casting-initiating device, the casting notification has the arrow down or arrow up icon as shown below. This is for you to switch between normal casting notification (as shown below) or local casting notification (without the settings icon). You can tap arrow down icon (which will change to arrow up then) to show Settings icon as shown in the screenshot below. There are two ways to disable Google Home and Chromecast casting notification in mobile devices. As shown above, the Google Home and Chromecast casting notification have some play controls. The first one is always a Settings icon, by default. Tap the Settings icon as shown in the first screenshot. You are then directed to a Google cast settings page as shown below. Currently, there is only one item in this page. 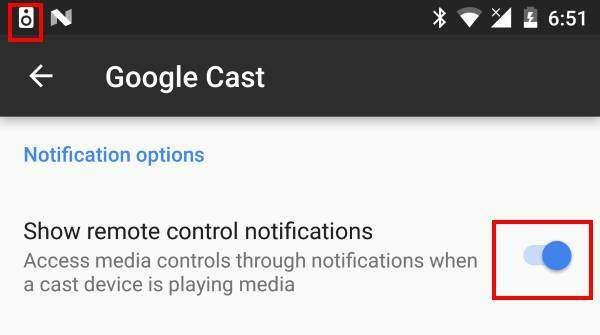 You can simply tap the option for Show remote control notifications as shown below to disable or enable Google Home and Chromecast casting notification. Method 1 mentioned above works only when the notification is active. 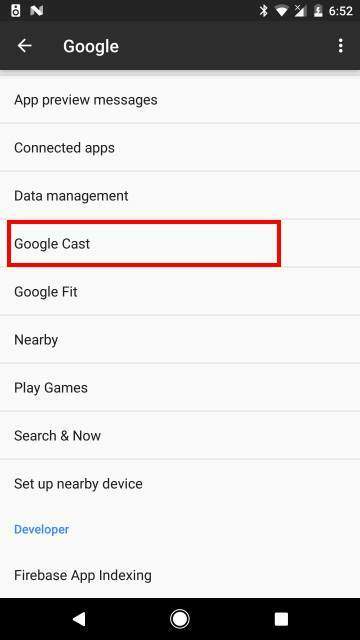 If you have dismissed the notification, or there are no casting devices now, you can still disable Google Home and Chromecast casting notification on your Android phone or tablet. 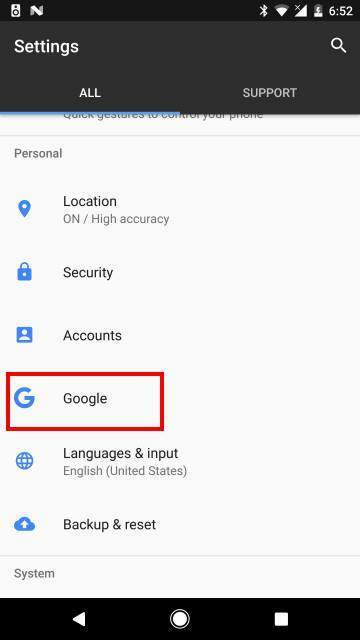 You can go to Settings –-Google as shown below. Tap Google Cast as shown below. You will then be directed to the same settings page as shown above. Of course, you can disable or enable remote notification controls similarly. Please note, although the setting for remote control notification is under your Google account, it is for this specific phone or tablet only. Other phones or tablets with your Google account are NOT affected. Can you disable Google Home and Chromecast casting notification now? If you have any comments or questions on how to enable or disable Google Home and Chromecast casting notification, please let us know in the comment box below. How do I remove casting entirely? Every time I walk into work my phone begins casting on the TV. I don’t use it and do not want it. Especially in my work environment. Which app is casting? I don’t think your phone can cast to TV automatically. It requires an app on the phone to initiate the cast. If an app does do this, you should not use such apps. If you are talking about the notification, you can follow this guide to disable the notification. You can remove casting function by uninstalling Google Home app. But for Nexus and Pixel phones, Chromecast is built-in. This needs a toggle setting in the Chromecast. I use the Chomecast to make hotel television bearable, with the downside that any joker in the hotel can stop/start/mute my viewing. I see the value in having this setting in the Chromecast, but for anyone with a shared wifi connection (hotels/dormitories/workplaces), the current setup is impractical. Yes, the setting should tired to individual Chromecast device, not individual phones. Anyway, Google’s argument is Chromecast is designed for home use. Anyway, I guess they will make some changes in such notifications. What is the difference between Google Home App and This Computer [PC] setup? For setup, there is no difference. But the Google home app has more features for using the device. Are there any known issues with Samsung Galaxy s6 edge phones? My casting notification is enabled but I never have the option to control things that others are casting, nor my own casting items (music, tv). It’s been driving me nuts! There are no known issues for S6 or S6 edge. Can you get the notification? You need to install the Google Home app on the phone to get such notifications. If it’s installed, you can check whether your S6 can find your Chromecast devices inside the Google home app.